Oculus Rift fans and developers might be interested in a new device called the Eye Mirror which is an adapter that fits to almost any video camera, compact camera or even GoPro action cameras. Once attached the video camera can then be used in conjunction with the Eye Mirror device to capture 360 degree video which can then be shared in 3040 x 3040 running at 22 fps if you use a firmware camera modification on the GoPro cameras. Watch the video after the jump to learn more about the Eye Mirror project and see it in action. “The Eye Mirror Lens can simply screw onto the front of your video camera or DSLR. Using the compact adapter pictured below you can use your compact camera. The GP360 GoPro version has its own GoPro style housing that you can simply put the camera into. 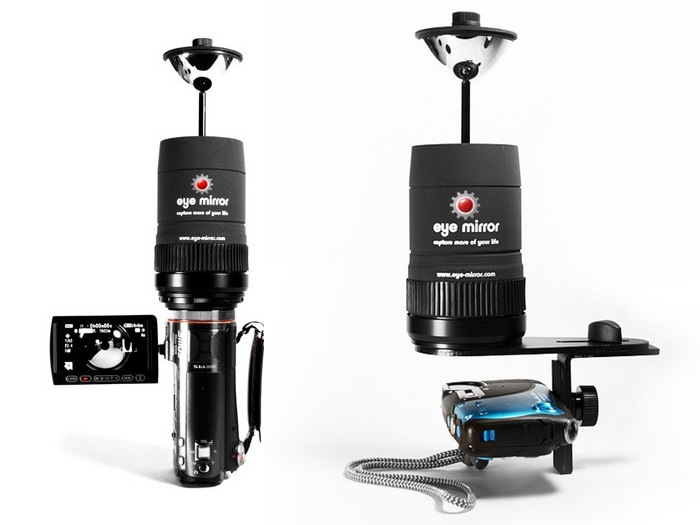 The EyeMirror lens allows you to shoot interactive 360º degree video we call EyeVids or 360º still images. Simply point your camera up and start recording. Once you have finished shooting simply upload your video to our web site and then you can share links to your friends and family. “Resolution is everything for a virtual video environment. We currently have the highest resolution consumer 360 video device when our GP360 lens is partnered with the GoPro 3 black (+) and our firmware modification. High resolution is essential to drive the Oculus. The Eye Mirror project is currently over on the Kickstarter website looking to raise enough pledges to make the jump from concept to production. So if you think Eye Mirror is something you could benefit from, visit the Kickstarter website now to make a pledge and help Eye Mirror become a reality.